This Lyndonville polling place was once a school, but has since been turned into town offices for Lyndon. 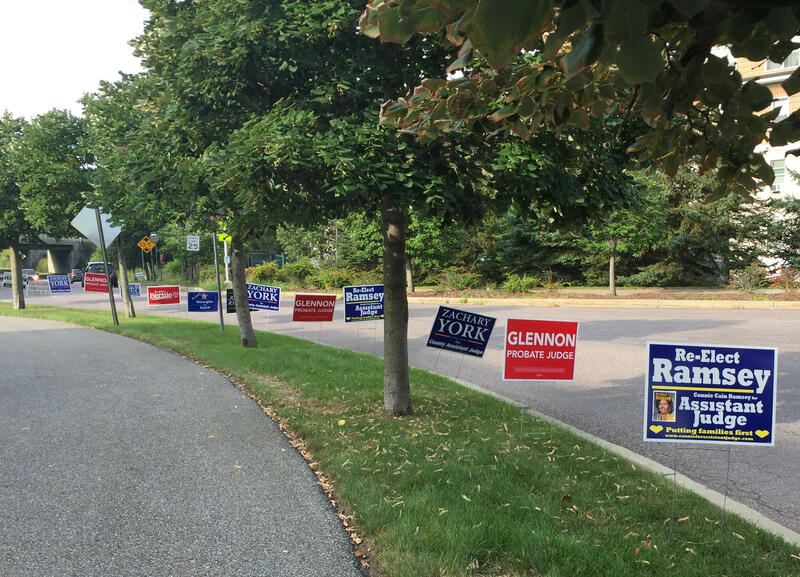 A sign lets Burlington's Ward 5 voters know where to vote Tuesday, as various candidate signs line up behind it. Signs for various candidates line up along Farrell Street in South Burlington on Monday, the day before the primary election. VPR is keeping you up to date on what's going on around the state as Vermonters head to the polls. Vermont's 2018 primary election is Tuesday, Aug. 14. Hey, that's today! To stay up to date on the happenings of the day, VPR has a few ways to help you stay in the loop. Bookmark this page, which will serve as our primary election live blog. Throughout the day we'll update the page with photos and dispatches from around the state. Click here to jump to the live blog below. We'll also track statewide election results (as well as Vermont House and Senate results) online from The Associated Press. Follow @vprnet on Twitter for updates and to find out where our reporters are roving around — and check the #vtpoli hashtag for more conversation around the Vermont primary elections. We'll have special newscasts throughout the evening to fill you in on the latest results. Tune in to VPR on your radio or the online stream to catch those updates. And check back Wednesday during Morning Edition, Vermont Edition and here online when we will have more coverage and analysis of primary election results. Looking to brush up on candidates' positions before casting your ballot? Find VPR's interviews, debates and profiles here. And did you know that Vermont has same-day voter registration? Find more on that, and other election-related information (for example, to learn where your polling place is) at the Vermont Secretary of State's website. Update 11:57 p.m. — OK, we're going to shut this down for the night — but keep an eye on VPR.net for some more coverage of the primary election results, as well as over on the VPR Twitter for any updates that may get posted there. Thanks for joining! Update 11:34 p.m. — Two incumbents have advanced in a contentious Democratic state Senate primary in Washington County. Sens. Anthony Pollina and Ann Cummings both secured a spot on the ballot in November, and challenger Andrew Perchlik will also join them. Perchlik is director of Vermont's Clean Energy Development Fund and is the founding director of Renewable Energy Vermont, a trade association. Update 11:00 p.m. — The Scott campaign was stationed at the Comfort Inn in Berlin this evening, and the governor spoke to media at a victory party. Also it's getting late — so very understandable if you are headed to bed. In that case, a friendly reminder that you can tune in for more discussion about the primary election results tomorrow on Vermont Edition at noon. 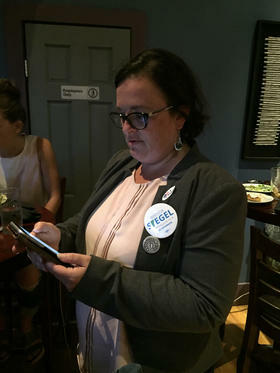 Update 10:26 p.m. — No speech from Siegel but she said it's clear she didn't win and if a Democrat doesn't win in November, she'll likely be a candidate in 2020. Siegel also said she'll work to get Hallquist elected. Ehlers also did not make a concession speech, and he did not rule out running as an independent in November. Update 9:50 p.m. — In the Republican primary for U.S. House, H. Brooke Paige is declared the winner by The Associated Press, over Anya Tynio. Brooke Paige was on the Republican ballot for 6 different offices in this primary election. Update 9:37 p.m. — With the Democratic gubernatorial primary race called by The Associated Press, Hallquist gives her victory speech, while James Ehlers concedes. But in Brattleboro, Brenda Siegel said she still wants to wait until more precincts are in. Update 9:19 p.m. — Winners have been called by The Associated Press in both the Democratic and Republican gubernatorial primary races. Per The Associated Press, Gov. 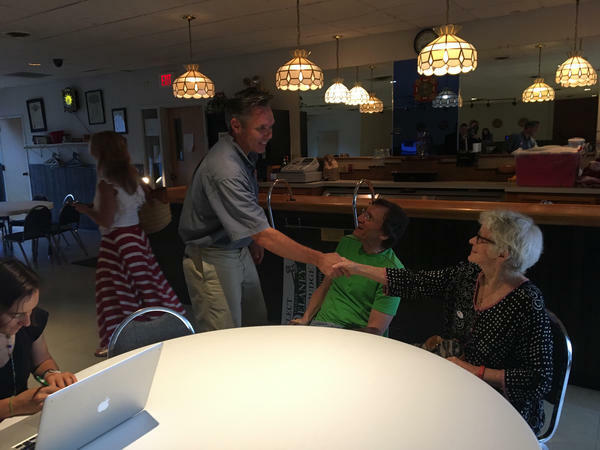 Phil Scott has defeated challenger Keith Stern in the Republican gubernatorial primary race, and Christine Hallquist has been named the winner of the Democratic gubernatorial primary contest. Update 8:51 p.m. — Another current member of Vermont's congressional delegation has been deemed the winner of their primary race this evening, as The Associated Press has called Rep. Peter Welch as winner of the Democratic primary for the U.S. House of Representatives. Update 8:38 p.m. — A look at a result now from Windham County: The Associated Press is reporting that incumbent Windham-2-1 Rep. Valerie Stuart has lost to challenger Emilie Kornheiser in that district's Democratic House primary race.
.@Christinehinvt Hallquist making the rounds at a very well-attended election night party at the Skinny Pancake in Burlington. Update 8:18 p.m. — The Associated Press has called Sen. Bernie Sanders as the winner of the state's Democratic primary race for U.S. Senate. Actor Mark Wahlberg is also a guest this evening on Colbert's show, in case you were wondering. Update 8:07 p.m. — At his election night event earlier this evening, Democratic gubernatorial candidate Ethan Sonneborn said his unlikely campaign for the state’s top elected office has been a success no matter the result of tonight’s vote. “I’ve said from the beginning, if I get one young person who wasn’t going to vote voting, my campaign is a success,” Sonneborn said. The 14-year-old candidate said he thinks he has a chance of pulling out a victory tonight, and is surrounded this evening by friends, classmates and family members at Aerie Consulting, where his father works. Update 7:53 p.m. — Steve Zind is covering Democratic gubernatorial candidate Brenda Siegel's election night event in downtown Brattleboro for VPR. Siegel said she's nervous and trying not to get too invested in every incremental change in the early tally. "I think I'll come in first or second. I hope first," she said. Siegel also said she's happy with the campaign she ran that she says energized many more voters than people expected. Update 7:40 p.m. — And now an update to John Dillon's update from just a few minutes ago, as Democratic gubernatorial candidate James Ehlers has now arrived at his Burlington event and is greeting supporters. Update 7:36 p.m. — As we mentioned, a number of VPR reporters are out in the field at gubernatorial candidates' election night events. 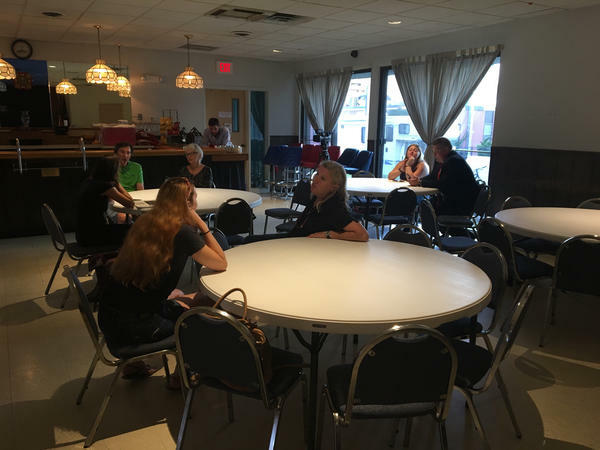 VPR's John Dillon is covering Democratic candidate James Ehlers' primary night event at VFW Post 782 in Burlington, and he reports just a handful of media and attendees in attendance at the moment. Update 7:10 p.m. — And now polls are closed! 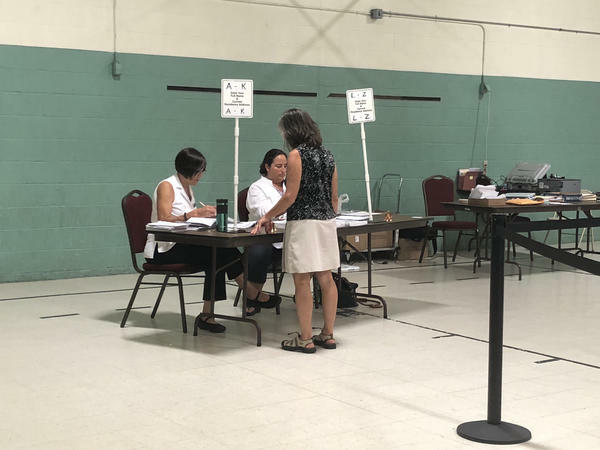 As the deadline drew close, an exchange on Twitter between Seven Days reporter Taylor Dobbs and journalist Aimee Picchi noted that Burlington's Ward 6 had to make use of some previously recycled blank ballots in order to meet the demands of voter turnout there. 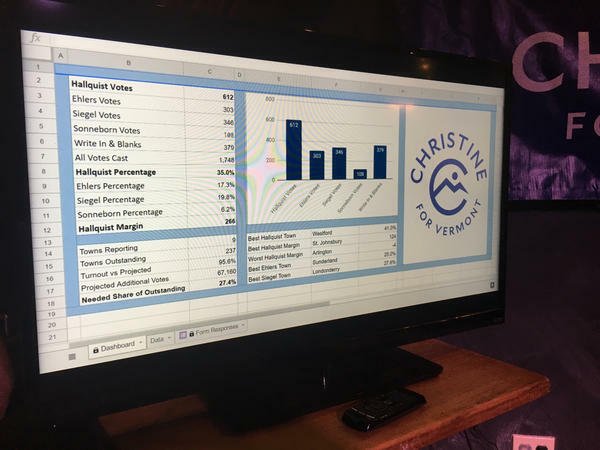 Update 6:19 p.m. — Democratic gubernatorial candidate Christine Hallquist is also holding her election night party in Chittenden County. In addition to the presence of local media tonight (including our own Peter Hirschfeld, who is there to cover the event), the campaign is also expecting national and international media to be in attendance this evening. The Skinny Pancake stage in Burlington, where @Christinehinvt will give her election night speech later today. Update 5:45 p.m. — OK, we're at 75 minutes until polls close. As that 7 p.m. mark is approaching, now seems like a good time to remind you that once polls close, this is the post you'll want to check out for statewide results from The Associated Press. And if you're looking for county-level results, those will be available at the Vermont Secretary of State website. Today there are signs that turnout is strong in some areas (see below). And of course stick with us here on the blog as we await the results and get some more updates from our reporters out in the field. Right now, VPR's Peter Hirschfeld has stopped by Democratic gubernatorial candidate Ethan Sonneborn's election night party that's taking place in Winooski.
.@RealESonneborn may not be old enough to drink yet, but the kid’s got a pretty sweet beer tent for his election night party here at Aerie Consulting in Winooski. Update 3:36 p.m. — In Vermont's capital city, voter turnout has been strong today — Montpelier City Clerk John Odum told VPR's Bob Kinzel that turnout will probably be between 35-40 percent, fueled by the competitive Democratic state Senate race in Washington County (here's The Times Argus write-up from July following a forum with those candidates) as well as the Democratic gubernatorial contest. Update 3:00 p.m. — There is now 4 hours until the polls close. So how has turnout been? VPR intern Ari Snider checked back in at Ward 8 in Burlington. 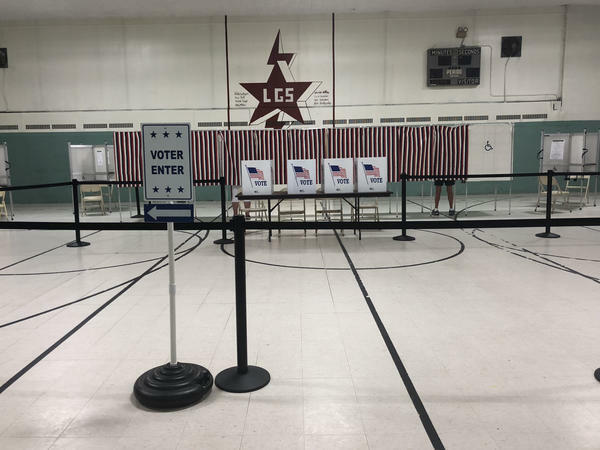 A poll worker told him that as of about 1:30 p.m., the ward had seen less than 100 voters — but that is partly due to the high concentratiron of student housing in the area. Meanwhile in Lyndon, VPR's Amy Kolb Noyes reports that 212 voters of about 3,300 voted by 1 p.m. (and that 212 figure doesn't include 60 absentee ballots that had been turned in). "We had a really heavy turnout this morning, much more than I anticipated," said Lyndon Town Clerk Dawn Dwyer. 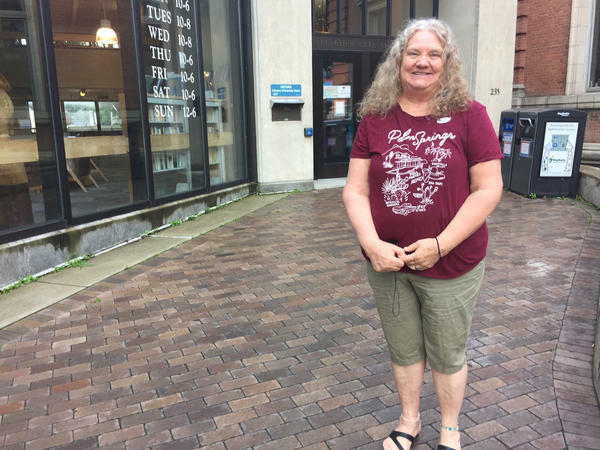 Amy also spoke with Tracy Wagner, who was gathering signatures outside Lyndon Town Offices or funding for Northeast Kingdom Youth Services to be put on the Town Meeting ballot. Wagner said response has been "really good," having got more than 100 signatures this morning. And over in Morrisville? A Twitter account run by the Morristown Alliance for Culture and Commerce noted higher than expected turnout (both at the polls and due to absentee ballots). Update 12:14 p.m. — OK, we're officially into the afternoon on Primary Election Day, but polls don't close in Vermont until 7 p.m. So there's still plenty of time to cast your vote if you haven't yet! And if you're looking to learn more about the candidates before filling out your ballot, you can browse VPR's Campaign 2018 coverage here. Update 10:52 a.m. — VPR's Jane Lindholm created a Twitter thread with a look at the Republican, Democratic and Progressive ballots a Vermont voter will receive today at the polls.